This week’s episode addressed “The Mom Factor.” It is important to any girl that her mother be present while searching for her wedding dress. The absence of your mom can be sad, as well as make you second guess your decision to pick a certain dress. 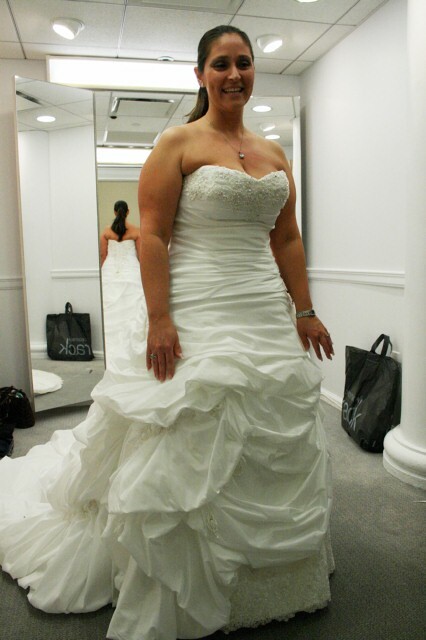 The “mom stamp of approval” can give a bride the confidence to say yes to the dress. 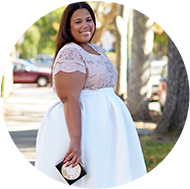 Grace is a stylist and a self-described fashionista, so she feels confident that she can find a dress, even without her mom. Fashionista, Grace, definitely recognizes her body type and was very comfortable in her skin. The dress on the left made her look like (in her words) like she had two junks (referring to her derrière). In her confidence, I love that she still recognized that doubling the size of any part of her body is not a good idea. Grace found a dress (right) she wanted to “say yes,” to, but the absence of her mother made her second guess her decision. She didn’t end up buying a dress that day. Morgan describes her mother as the most opinionated, and hopes to get her final approval. 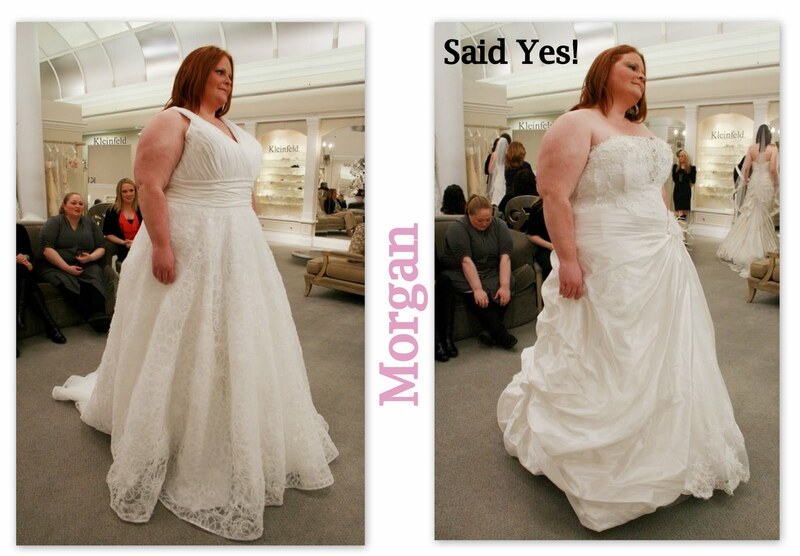 Morgan definitely valued her mother’s opinion at the fitting. She wanted her mother to love the dress that she picked, but she also wanted to feel the same. The fact that nearly all of bridal dresses are sleeveless was a huge concern. This bride has the concern that a lot of women do…her arms! As a stylist, I run into women all the time who avoid showing their arms. In everyday clothes, it is easy to conceal your arms, but in bridal it is almost impossible. Nearly all bridal gowns are strapless or sleeveless. If you just can’t wear your arms out on the big day, an easy option is to add a bolero. A bolero is a short cropped jacket that can be easily added to most wedding gown. Jennifer is "heartbroken" at her fitting. Jennifer really wanted her mother to be there for the final fitting of her dress. The great thing was that her mother was there for her when she chose the dress. Here is a comforting thought for those brides that could not have their mothers present on their fitting day…the first time your mother will see you in your dress will be on your wedding day. That definitely has a magical element to it. I think bride should really evaluate if they can pick a bridal gown without their mother. If you don’t feel that you can, wait until your mother is available. Another great way to involve your mom (if the bridal boutique will allow) is to take pictures of the dress that you want to pick. With distances and schedules separating us from our mothers it is sometimes hard to be able to coordinate for a fitting. The great thing is that regardless of whether your mom can be there or not, she definitely would love to be there and that is what counts. To my ladies that have bought a bridal gown. Was your mom there for your fitting? I had my mommy with me! First: I'm so excited you're getting married. I can't wait to see pictures.